Up on the innovative new e-book site Zola Books, this Q and A with me. They asked such great questions! Though the fastest growing religion in the world, Islam is deeply misunderstood by many—including some of its most ardent believers. In her new biography of Muhammad, The First Muslim, award-winning author and former foreign correspondent Lesley Hazleton portrays Islam’s founder as a rebel, a defender of women’s equality, and, above all, a human being. In this Zola Q&A, Hazleton discusses how Muhammad’s world forged his identity and what he might think of the Middle East today. What inspired you to take on Muhammad as a subject? There’s been so much written about him. Did you think there was still something missing? Yes: Muhammad himself! You’re right, there’ve been millions of words written about him, but the more of them I plowed through (I read several biographies as background research for my previous book, After the Prophet), the less I had any real sense of the actual man. It was like looking through a telescope the wrong way round: he seemed to be reduced to a two-dimensional cipher by this mass of verbiage. Much of it was devotional, the rest of it kind of cautiously dutiful, and even soporific. How could anyone do that to such a remarkable life? I wanted the vitality of a real life lived. I wanted to see him whole—not as a symbol, but as a multi-dimensional human being. The book looks closely at the physical world he occupied – the nights on Mount Hira, watering goats in the desert, his feelings of confinement in Mecca as a boy. Did you visit all these places? I would have, but non-Muslims aren’t allowed in either Mecca or Medina. And besides, there’s hardly anything left of what these cities once were; nearly everything’s been built up and covered over. But I had the advantage of a strong feel for the landscape and culture of the Middle East. I was based in Jerusalem for thirteen years, spent a year with Beduin in the Sinai desert, and have roamed freely around both Egypt and Jordan. And yes, I’ve spent nights alone on top of another sacred mountain not that far from Mecca: Mount Sinai. You take odds with the conservative Islamic view that Muhammad was destined to be the messenger of God. Do you have any concerns as to how conservative Muslims will react to this book? True, I don’t see his life as a matter of foreordained destiny, but as an extraordinary human struggle for dignity and social justice. I think it’s clear from the tone of the book that it’s written with respect for its subject. I mean, isn’t that the point of good biography? Respect for the integrity of a full life lived? For the integrity of reality? Of course the way I see things conflicts in places with the conservative Muslim view, which is sometimes more devotional than historical. But I think we’ve agreed to respectfully disagree. What do you think are the most common misunderstandings about Muhammad that we have in the West? There’s a ton of them, most of them politically manipulated, but let’s take just two. First, there’s the image of the lecherous polygamist. In fact his marriage to his first wife, Khadija, was a loving monogamous relationship that lasted twenty-four years until her death. Even after he later married nine other women—nearly all of them diplomatic alliances such as any leader made at the time—he openly mourned Khadija until his own death. And it’s striking that while he had four daughters with her, he had no children with any of the late-life wives. Second, there’s the image of the militant sword-wielding warrior. In fact, Muhammad only took up arms after years of downright Gandhian passive resistance to increasing verbal and physical assault, culminating in a concerted attempt to assassinate him. And when he finally did so, under political pressure, he made it clear that as the Quran says, “forgiveness and mercy are more pleasing in the eyes of God.” Combat was permitted, that is, but to be avoided if at all possible. The book points out that Muhammad might never have gone on to found Islam if not for the support and understanding of his wife Khadija, and Muhammad himself rejected the tradition that daughters were less valuable than sons. Yet women are often treated as far less than second-class citizens in many Islamic cultures. Why do these attitudes persist? What happened to Islam after Muhammad’s death is what happened also with early Judaism and early Christianity. All three began as protest movements for social justice, but then fell prey to the seemingly endless human ability to mess things up. That is, they became institutionalized. Their radical roots were covered over with conservative dogma, and an all-male hierarchy imposed their version of “the Truth” (always with a capital T), forcing their cultural prejudices on everyone else. This is now changing rapidly in both Judaism and Christianity, popes and chief rabbis notwithstanding, and I think it is beginning to change in Islam too, ayatollahs and grand muftis notwithstanding. What do you think Muhammad would make of the Middle East today? Great question! Let’s start with Mecca itself: I don’t see how he’d be anything but totally dismayed. He’d be the first to point out that the Saudi regime is the modern equivalent of the wealthy elite who ran the city in his own time, profiting off piety and persecuting him for his message. If Muhammad were alive today, he’d probably be the Saudi kingdom’s worst nightmare, much as the real Jesus would be the Vatican’s worst nightmare. He’d condemn sectarianism. He’d condemn extremism. He’d condemn suicide bombing and terrorism, and call them obscene. He’d say what the Quran says: “Let there be no compulsion in religion.” And he’d commit himself fully to the hard and thorny process of making peace. With other words he would be promptly executed by the ruling classes. where to get your book in Malaysia? Bought mine at Kinokuniya, Suria KLCC (RM104.36). And Ms Hazleton, you are simply an inspiration! Is your book available in Egypt? Alas, authors are the last to know. I hope it is, but don’t know for sure, so do let know if you find it. Certainly it should be available after UK publication a few months from now. I have read several biographies about Muhammad but your comments have left me excited to obtain copy of your book. I promise this one will keep you awake! — L.
To unsubscribe, go to the Email Subscription section in the left-hand column of this page, click on Manage, then Unfollow. Everyone, from the most learned to the most ignorant, has a concept of God. A God that we love, get angry with, judge and even accuse, at times, for doing wrong by us! We imagine this God, who sits on a star in the heavens or dwells somewhere in space, to be like a benevolent paternal figure or a majestic sultan! The reality is Allah is not a god (deity) and this god-concept we have all come to embrace, as a result of misleading information and conditioning, is not the Allah expounded by Muhammad (saw). So what is Muhammad’s Allah..? A talk of yours from TED brought me here and after reading I wanted to thank you. As a Muslim from the west (now residing in Malaysia) the misconceptions about our prophet are many…most of them being born from Muslims themselves. I am proud to follow a man who rose up against corruption and tyranny. ..promoted peace and dialogue and as you say would be fighting against what Muslims do today…if he were here. I look forward to reading your book. On page 13 of your book The First Muslim and repeated on page 42 you cite that Abraham’s son Ishmael was to be sacrificed, but it was not Hagar’s son who was to be sacrificed but Sarah’s son Isaac. Except for this error, if it is an error, I am really enjoying your book and I thank you for it. Larry — different traditions. In Jewish tradition, of course, it’s Isaac. In Islamic tradition, Ishmael. Since I was talking about what people in Mecca believed, I cited Ishmael. Strictly personally, I’d love it if we could think of Isaac and Ishmael as the same person. Your shamelessly sycophantic hagiography of Mohammed the godfather of centuries of medieval religious violence and oppression of women to this day and your confabulatory whitewash of Islam which blithely ignores most of what is written in the Koran is a tour de force of intellectual dishonesty which places you firmly in the league of that other mistress of Orwellian doublespeak marinated in political correctness -Karen Armstrong. “Truth always makes you nervous” you say in your introduction. Indeed, that must be why you so deftly skirt it in your writing. This has come to me as shock from Karen Armstrong who I always thought differently and as a patron of Islam! Shocking Karen! Afterall, a rebel first from Judaism and Holy Torah and from Islam too which is the only religion outside Christianity to wholly believe in Jesus and all his miracles and the Gospel to him, but not as a deity of worship. There is no deity but GOD. I wish I could tell her more privately on her email if I had that. Am sure Karen Armstrong would just love to hear from you. Is Irwin interested in truth or propaganda ? Asim — a rhetorical question, I assume! I let his comment run because it was so obvious it made me laugh. L.
People who do not read the Qur’an usually jump to wrong conclusions about Islam & Muhammad. Congrats Lesley Hazelton! You have done well. May Allah be pleased with you. Ameen. 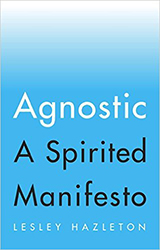 Lesley , Thanks for your book .I watched your interview with well-read and talks on YouTube and they encouraged me to read your book knowing that I might agree with some of your outsider insights or might disagree with it all . I have read many biographies about the prophet but yours were different . I still disagree with some of your interpretations , but at the end I respect your empathy and your dedication to scour for the truth behind the real man . 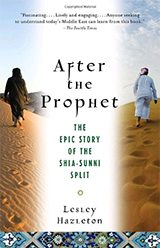 All the best and I am planning to read your book about the Sunnis Shias split . Thanks Khaled — I think disagreement with respect is far more productive than unthinking agreement (in fact I fail to see the respect in that). Hope ‘After the Prophet’ lives up to your expectations, both agreeing and disagreeing! — Lesley. Dear Lesley, You write: “He’d condemn sectarianism. He’d condemn extremism. He’d condemn suicide bombing and terrorism, and call them obscene.” You are projecting onto Muhammad your own idealized notions and beliefs. It was Muhammad who introduced an us vs. them sectarianism into his community by condemning the gods of his fellow Arabs. The only sectarianism he was not prepared to tolerate were schisms within his own community, an objective common to any leader whose power rests on the unity of the foot-soldiers he commands. Through Allah Muhammad condemned a whole laundry list of people whom he derided as idolaters, polytheists and most of all unbelievers who rejected his prophet-hood. Many of these were themselves worshipers of the pre-Muhammadan Allah and their only crime was to reject the prophet-hood of Muhammad. They did so precisely because they recognized in Muhammad a dangerous extremist whose teaching would stamp out all other beliefs. And they were right. A rich and fecund Arabian religious landscape, teeming with diverse religions and spiritual traditions, was homogenized into a one-religion desert that it continues to remain to this very day. It is a fact that upon being rejected by Jews Muhammad’s response was to turn them into targets of ruthless violence, that too, astoundingly in the name of the god to whose worship they clung until they were either executed or exiled. Is this sort of mass violence not the fundamental characteristic of an extremist? As for suicide bombing and terrorism Muhammad himself encouraged his followers to die and kill for him while he mostly kept himself behind the front-lines. How is this any different from modern day suicide bombers? Where is there room left for any moderation once you have established your willingness to slaughter in the name of your god and religion? If that is the case then great “prophets”, the Muhammads of our own times, such as David Koresh and Jim Jones have to be feted as moderates as well. There have been other religious figures that have taken to violent means to protect and defend themselves against oppressive political powers. Consider the Sikh gurus for example. They fought the brutality of their pious Islamic rulers but never did anything comparable to what Muhammad did, which was to send out diktats to all and sundry to submit to his god, failing which he would invade them. This is megalomania and not religious piety. Please remove the blinders and look at the obvious reality staring you in the face. Also it is not tenable to excuse the violence and blood-letting at the hands of Muhammad by placing it in the context of his environment. For example, Jesus’ message of “love thy enemy” was had already entered the Meccan community with one of Muhammad’s own close relatives even translating the gospels. The ruthlessness displayed by Muhammad’s Allah rests squarely on the shoulders of the man and cannot be blamed on his times. A prophetic voice, indeed. And whose was it? Not Muhammad’s, but that of Jesus (the verse cited is Matthew 10:34). I’d suggest reading both the Hebrew bible and the New Testament very carefully before singling out Muhammad and Islam for condemnation, since the Bible is one of the most blood-soaked and bloodthirsty books ever written. (Of course you might also want to read the whole of the Quran, as well as my actual book instead of a short QandA on it). Then you might ask yourself why you have singled out Islam. If you are opposed to all religions on such grounds, that’s one thing; if you are opposed only to Islam, that is quite another. Lesley Hazelton is so right. Please read the Qur’an, if you really care to learn the truth at all. Thank you for responding Lesley. It is wonderful to be able to converse directly with an author rather than just post reviews of books and such. My previous comment was not directed at your book but specifically at your claim that Muhammad would somehow be opposed to modern day Islamic extremism and terrorism. If you are saying that the quote from Jesus is worthy of condemnation then I will not disagree with you. Still, the very next sentence following the quote should make it clear that “sword” was used in a symbolic sense as a metaphor for division, separation and opposition between father and man, mother and daughter etc. etc. But please ask yourself if even a mere violent quote from Jesus is worthy of condemnation how much more we should condemn a man who authorized mass murder, used god to repeatedly stereotype, demonize and dehumanize entire groups of people who chose to exercise their independence and reject his authority over them. These are exact parallels to modern-day charismatic “prophets” who use their exclusive access to god as an an absolute control-mechanism over followers to abuse them and to violate others through them. First, please note that there is a 250-word limit on comments here on the AT — clearly stated upfront — which is why I’ve edited out all but the first two paras of this one, which essentially was a repeat of your previous one, though with the addition of the charge of intellectual dishonesty on my part. Clearly we’re going to get nowhere with charges and counter-charges. Equally clearly, on the issue of violence, you have not compared the Quran to the Bible. 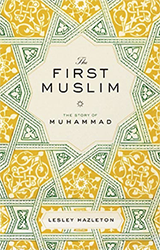 Nor have you actually read ‘The First Muslim.’ So again, I’d urge you do both before commenting again on the quality of my intellectual integrity (under 250 words, please!). I haven’t bought your book, but your blog post is factually incorrect. the Prophet Muhammad had a son with Meryem the Copt – he died as a baby. Hatice — whether he fathered this infant or not (and yes, I did indeed discuss this in the book), he was not married to Maryam.